This week we watched the finale of American Idol. We really haven't kept up with it all season, but the finale showcases so many musical greats that it is almost like watching the Grammys. The stars included Keith Urban, Kiss, Queen Latifah, Lionel Ritchie, Jason Mraz, Steve Martin, Rod Stewart, Black Eyed Peas, Cyndi Lauper and Carlos Santana. David Cook, the American Idol Season 7 winner also performed. Judging by the finalists and past winners, it seems America prefers male vocalists as of late. While this next review really has nothing to do with American Idol, if you are a fan of style of vocalists currently winning on the show, you'll also like this up-and-coming male pop singer named Aaron Barnhart. 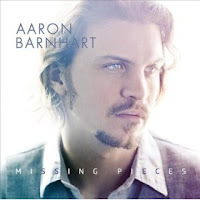 His debut CD titled Missing Pieces is set to release on May 26th. A single off the album called "Day In Day Out" has already received some good air time after releasing on March 23rd. Aaron Barnhart's strong and soulful voice resonates in his emotion filled songs strung with tales of heartbreak and hope. He wrote all the songs in his album and you can tell he puts his all into singing them. He is trained in classical and jazz piano, and I especially love the piano accompaniment in many of his songs. I'd classify this album's genre as pop skirting adult contemporary. Of the 10 tracks on Missing Pieces, my very favorite is "Whatever You Get." The uplifting lyrics ring so true, remarking that whatever you give will eventually come back to you full-circle. The jazzy upbeat piano sound just makes me happy. I also like the popular "Day In Day Out" and can identify with the yearning in "One More Second Chance." He briefly refers to Matthew 10:29, a biblical verse about sparrows in his final song, "Slings & Arrows." Thanks to Family Review Network and Aaron Barnhart/Bonded Records for this review opportunity!